12 Mini doughnuts filled with a chocolate and hazelnut flavoured sauce with cinnamon sugar. Treat yourself with this Spanish street food favourite. Frozen chocolate and hazelnut churros. 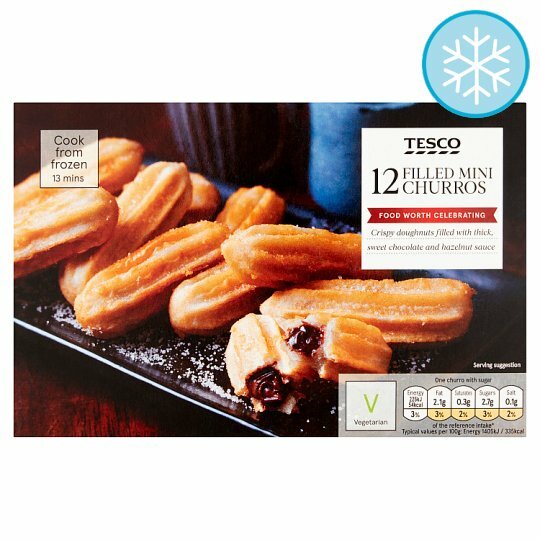 Cooked from frozen in 12 mins, enjoy with the sugar lightly sprinkled over the top. INGREDIENTS: Water, Wheat Flour, Sunflower Oil, Sugar, Cinnamon Sugar, Fat Reduced Cocoa Powder, Corn Starch, Hazelnut Paste, Salt, Emulsifier (Sunflower Lecithins), Flavouring. For allergens, including cereals containing gluten, see ingredients in bold. Also, may contain peanuts, other nuts and milk. Instructions: Oven: 190°C/Fan 170°C/Gas 5 8-12 mins Place on a baking tray in the centre of a pre-heated oven for 8-12 minutes. Once cooked remove from the oven, place on a serving tray, sprinkle with the cinnamon sugar and leave to stand for 30 seconds before serving.